Rice is a very important part of the Brazilian cuisine and is served at least once a day. This way might be your answer for making delicious and fluffy rice at home. 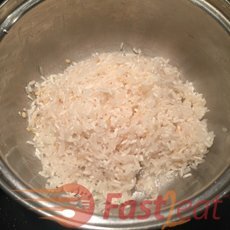 Wash and drain rice. Rinsing rice helps get rid of any starch and impurities. Place the rice in a large Strainer and rinse thoroughly with cold water until the water runs clear and not cloudy. Drain all the water set aside to dry. 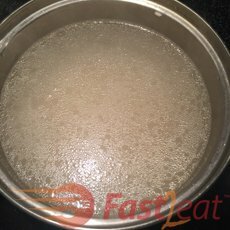 Boil water using an Electric Kettle . While the water boils, you prepare the rest. Chop the onions (if using) with Electric Chopper and garlic finely (or use this Minced Garlic ). 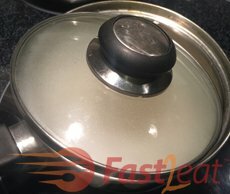 Place a Saucepan (rice gains 50%-60% volume after cooked, so choose something with room) over medium heat and add the oil. Add the chopped onions (if using), garlic and salt. Sauté until translucent, soft and fragrant, stirring constantly to not let brown. 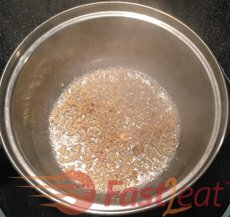 Add the dry rice to the pan and stir (a practice known as “refogar”) until there is no more water, making sure that the rice does not stick to the bottom of the pan (do NOT let brown). That seals the grain and also lubricates it, guaranteeing a loose rice at the end. Pour 1 ½ to 2 cups of boiling water to the rice, and stir. You can adjust the amount of water used depending on whether you like your rice more al dente or less. So if you like your rice a little al dente, use a little less water. If you like it soften, cook with more water. When water is finally added, it should be given generously, and the rice is then finally put to boil. Reduce the heat to medium-low. Place the lid on the pot at an angle, tilting it to allow steam to escape. Do NOT stir it any more time. Allow to simmer for about 10-15 minutes or until al dente. Look for "craters" after the rice has been cooking for a few minutes, when you stop hearing the water boil and all bubbles on surface have disappeared and the water has all absorbed and/or evaporated, check for holes or “craters.” Check it often in case the water has dried out and is burning your rice. When you can see holes or craters, put the lid on tight. Turn off the heat and let the rice sit untouched for 5 more minutes. Taste and adjust salt if necessary. Fluff with a fork and serve as a side dish. This rice will keep fine in the fridge for up to a week. It is important to sauté the onion (if using) really well, because if not, the onion will get bad and sour fast and so will your rice.